Enter the exciting world of rapid prototyping! 3D Printers are almost commonplace in schools, libraries, and even our own homes. However, many people don’t understand this technology or how to take advantage of it. In 3D Design and Fabrication you will learn how to properly design for 3D printing and develop a basic understanding of the printing process. We will also introduce molding and casting techniques that will allow for faster and stronger construction. Through these processes, you will gain a deeper level of understanding and appreciation for what these amazing machines can do. Many of today’s most popular games are powered by extremely sophisticated real-time 3D game engines that incorporate complex mathematical concepts and advanced graphical algorithms. This advanced-level workshop draws from the previous courses in the series and translates these concepts into a 3D environment. You will explore how objects are defined and rendered in a virtual 3D space, as well as how these objects can be manipulated in a game. This workshop is taught using the C programming language. 3D modeling and digital sculpting tools are heavily used in the entertainment industry to create realistic models of characters and creatures featured in today’s video games, animations, and films. In this workshop, you are introduced to an array of digital modeling, sculpting, and painting techniques to create 3D models that are ready for animation. You will also learn fundamental art skills relevant to character and creature design to help ensure that your work looks amazing. Today’s digital production artists must rely on strong traditional art and animation skills to meet the audience’s visual expectations. Through a variety of hands-on projects, you will be introduced to the tools and techniques professional artists use while creating their own 2D and 3D animations. You will experience firsthand how each step of the art production process works while also developing foundational skills, including drawing and sculpting. The prevalence of artificial intelligence (AI) continues to grow in software applications for industries such as gaming, robotics, finance, retail, manufacturing, military, and even medical diagnosis. This workshop introduces you to the basics of AI and provides opportunities to program AI for gaming and robotic systems platforms. In this workshop, students focus on creating virtual reality experiences and games. By the end of this workshop, students will have a greater understanding of the professional applications of VR technology as well as a deeper understanding of the game development pipeline. Character designers have the exciting opportunity to create characters whose body type, costuming, and props reflect their unique personalities. This workshop teaches you how to design characters, from the initial concept stage all the way to the modeling of a maquette (a small sculpture of a character). Throughout this process, you will also examine how designers strike a balance between making characters that are both fantastic and believable. Students in the Computer Engineering track of the Pre-College Program study the mechanics of how computers work and learn how to use these powerful pieces of technology to their fullest potential. Pre-College Program application, including high school transcript providing proof of completion of Algebra 2. If you already know your cosplaying basics but are looking to refine your skills, Cosplay studio is here! This workshop will teach students more advanced cosplay skills like advanced patternmaking, wearable electronics, and adding wefts to wigs. The costuming world is vast, and we hope you’re excited to explore it with us. *Note: This is a non-digital workshop. Cosplay is a popular performance art where participants design and create costumes to represent characters from anime, comic books, cartoons, and video games. This workshop teaches you how to make your own costumes and covers such topics as costume design, sewing, stage makeup application, wig styling, prop building, and other techniques necessary to build complete costumes. This hands-on workshop explores different ways you can protect your online security, as well as how networked computers communicate with one another and how systems can become compromised. You will learn about data encryption techniques and career opportunities in cyber security. Are you are looking to dive into 3D Graphics Programming, Cyber Security, Artificial Intelligence for Games, or Mobile Application Development? Then this intensive 1-week workshop is for you. In Coding Fast Track, you will learn the basic computer science skills necessary to successfully complete our higher level programming courses. The instructors in Coding Fast Track will teach you the basics of programming in both C and Java. Topics will include Variables, Conditional Statements, Looping, Functions, Arrays, and more. This workshop is for those wishing to get started with programming but may not be focused on game programming. Coding Fast Track will satisfy the prerequisites needed for our advanced courses. 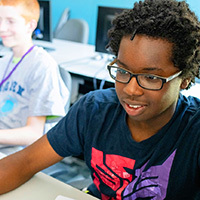 By learning the foundational skills of art, animation, and computer graphics, students in this track practice the skills necessary to produce sophisticated digital art for video games. Pre-College Program application, including high school transcript, and five drawings from observation. Game Design students learn about the fundamental principles of game design, the computer science that goes into designing a video game, and the storytelling and character creation skills necessary to bring video games to life. Pre-College Program application, including high school transcript, and a one- to two-paragraph writing sample that describes their favorite non-digital game and explain why it is their favorite, including one rule that they would change and why. Tabletop role playing games (RPGs) are a unique and exciting way to share adventures in fantastic worlds filled with danger and wonder. Central to this experience is the Gamemaster or GM. The GM plans the adventure, sets the stage, narrates the action, and portrays friend and foe to the adventuring party. Whether you are an experienced player, or brand new to tabletop RPGs, stepping into the role of GM can seem daunting. In this workshop, you will learn how to plan adventures, create and portray 3-dimensional non-player characters, and lead your players from the ordinary world to the extraordinary. 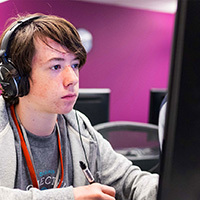 In the Game Programming track, students learn about computer science, mathematics, and physics, specifically how each of these disciplines relates to video game programming. Mobile devices like phones and tablets have created countless new possibilities for skilled software developers. This workshop teaches you how to program mobile apps while building on the programming concepts learned in the prerequisite course. You will create a variety of applications for a tablet computer to see just how developers take advantage of these powerful new devices. By focusing on the theory, history, and techniques of music and sound design, students in this program gain an understanding of what elements make a video game’s soundtrack and sound effects a compelling experience. Pre-College Program application, including current high school transcript, and self-assessment of their ability to play sheet music provided. To request self-assessment, please email projectfun@digipen.edu. This workshop offers a fascinating, hands-on approach to creating music and sound effects for games or animations. You produce unique, engaging soundscapes while learning about the fundamentals of music and sound design and their use in the video game and animation industries. In this workshop, you will examine the physics and engineering concepts involved with the flight of projectiles, including propulsion mechanisms, aerodynamics, and gravity. You will study how to convert potential energy into kinetic energy by designing and building a variety of launching systems such as slings, bows, catapults, and rockets. In this workshop, you build your own radio-controlled racing car and learn how to prepare and tune it for optimum performance out on the track. As you assemble your racer, you will explore the basics of car mechanics, physics, electronics, and radio technology. Participants will learn about essential racing concepts and strategies and go home with their own R/C racers. In this advanced workshop, students will build their own hobbyist-grade radio-controlled vehicle and learn how to prepare and tune it for optimum performance out on the track. As they assemble their racer, they will explore the basics of vehicle mechanics, physics, electronics, and radio technology. Participants will learn about essential racing concepts, rules, and strategies according the the official Remotely Operated Auto Racers (ROAR) manual. Ultimately, students will go home with their own R/C vehicle. The course goal is to build confidence in student racing ability with intent to participate in a local R/C club race, if they choose. This workshop introduces you to the math and physics principles and mechanical elements of flight, while teaching you how to build and fly a radio-controlled fixed-wing aircraft. You will also be exposed to concepts related to rotary-wing aircraft as you learn to fly small quad-copters. their own autonomous robots. While constructing their robots, students will learn the basics of mechanics, electronics, and software engineering while testing the limits of their creations. This fine arts course, based on DigiPen college curriculum, delves into the development of foundational art skills in drawing and color. You are taught the nature of drawing as a language skill, with special consideration given to applied observational drawing goals and critical thinking skills. You also learn the fundamentals of color theory. By the end of the course, you will have experience with basic drawing and painting materials and a strategy to continue the development of your artistic skills. This course assumes no prior art experience, but is intended for those who are seriously considering a career in traditional or digital art. Sound and music have a dramatic effect on the experience of playing a game or watching an animation. This advanced-level workshop allows you to develop the sound design skills used in a professional game development or animation studio. You will learn about Foley sound effects recording, music composition techniques, and the advanced tools and processes that musicians and composers use to craft their sound. By the end of this workshop, you will have performed, recorded, and processed your own soundtracks for a game or animation. This workshop is ideal for anyone who wants to take an idea for a 2D video game and make it a reality. 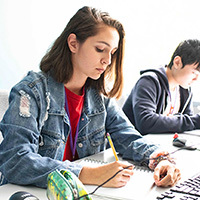 This workshop examines basic programming techniques, but also looks at the other disciplines needed to create a game, including game design, art production, and sound design. You will gain not only a new appreciation for the hard work that went into making your favorite games, but also the tools to start bringing your own game ideas to life. This workshop launches you into the world of computer programming through the practice of writing code for video games. The emphasis in this workshop is on learning the foundational programming concepts – including variables, conditional statements, and loops – that form the basis of games and other programs. You are also introduced to concepts in physics, graphics, and audio libraries while programming the logic for a series of PC games. What do Bilbo Baggins, Harry Potter, and Percy Jackson have in common? They are live in complete worlds filled with rich detail about their respective geographies, cultures, economies, and bestiaries. Building these worlds is an essential element of game design, art, writing, and filmmaking. In Worldbuilding, your student will create a complete setting that could be the basis of a future novel, film, or game. We will look at real-world and fantasy worlds that your student can use to create a unique setting of their own.